Cristiano Ronaldo wasn’t the only outfield player to put in a stellar showing. 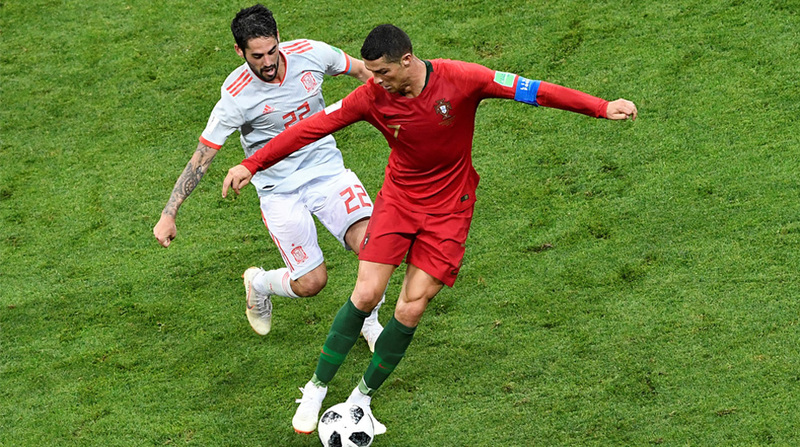 Portugal vs Spain at the 2018 FIFA World Cup was everything you dreamed of and then some for the six-goal thriller delighted fans around the globe with football straight from the top drawer. Cristiano Ronaldo announced his intentions with a sensational hat-trick, but there were plenty of other players who too, deserve recognition for their displays. Maybe, he could have done more for Costa’s first strike? Perhaps not since he was unsighted by his own defenders. Couldn’t really have done much for the second and had a pretty solid game overall. The Southampton fullback was bright and always eager to join in on the attack, even if his crossing let him down at times. Definitely should have done more to hamper Costa for the first equaliser. Was a tad lucky that the Spaniard didn’t get quality service, else Spain could’ve been out of sight before half-time. Went down too easily when Costa challenged him for the ball. Clearly there wasn’t much contact. Apart from that, the veteran did an okay job of marking the Spanish forward. Marginally better than his compatriot on the opposite flank, but few of his crosses were actually threatening. The Manchester City man tried his best, but found the going tough against a well-drilled Spanish defence. Clearly doesn’t have the legs anymore but his range of passing remains undiminished. Effective shield against the Spanish swarm. Couple of more outings like this and the whole of Europe will be queuing up for his signature again. Poor showing, will be lucky to start the next (Morocco) game. Subbed in the 68th minute. Did get an assist for Ronaldo’s second strike, but had a lukewarm game overall. Missed a relatively easy chance when his strike partner deftly laid it off. Another player in danger of missing out in the next game. Could go on and on about his genius but eventually fall well short. Replaced the ineffective Fernandes but didn’t have much luck either. The experienced winger came on with Portugal in each of an equaliser and while it did come, it wasn’t because of the former Chelsea man. Did attempt an audacious one from distance that had de Gea worried. Brought on in the final 10 minutes as Fernando Santos sought to get some extra height in the box, but didn’t get enough chances. Something about Spanish goalkeepers and opening games at the World Cup. Considering his pedigree, we can chalk it of as a one-off. Stupid foul gave Portugal a foothold in the tie but his sensational strike more than made amends. Actually did pretty well defensively. Couldn’t quite best his club teammate, but a decent showing from the Spanish hardman at the back. Like his central defensive partner, had an alright game. Which is strange, considering they conceded thrice. Another energetic display from the Barcelona fullback, even if his time-wasting tendencies get on your nerves at times. Justified his inclusion ahead of Saul and Thiago by putting in a real shift. Got cautioned for a dangerous tackle early on and didn’t quite have the impact he would have wanted. Did get the assist for Costa’s second. Like the other Silva, looked bright and enterprising, but had little to show for it. Lovely free-kick to set up Costa for the second goal though. He’s clearly not the player he once was, but almost managed to turn the clock back a few times in the tie with those intricate runs. Drew plenty of fouls and was seemingly everywhere but eventually trudged off without a goal or an assist. Any other day, would have been the MoM. As it is, the ‘Beast’ could fire Spain to World Cup glory if he keeps this up. Think of his heyday with Chelsea and you’ll get the picture. Replaced the fading Iniesta, but didn’t really have much of an impact in the 20-odd minutes he was on the pitch. The crafty Spaniard struggled to make things click against Pepe and Fonte. In hindsight, perhaps the wrong decision to bring him on in place of Costa. Came on for Silva just before Ronaldo’s leveller.